Lyle: Continue this strum pattern using a clean setting on your amp for the whole jam track. Lyle: Now you can play the verse section 2x, then the chorus, then start over. Lyle: Once you have memorized what to play, try playing it along to the jam track. Lyle: Notice in the video clip I'm muting all the strings after each rhythm burst. Lyle: Now you know two different rhythm grooves to play against this modern rock style jam track. Let's move on to scales and arpeggios. Lyle: The main chord is the B chord. It's a major type chord so you should lean towards using a scale that has a major third in it such as the B major pentatonic. It is simple to play and improvise with since it's only made from 5 different tones: 1 - 2 - 3 - 5 - 6. Lyle: Another good scale to try playing against this jam track is the B mixolydian. It also has a major third in it: 1 - 2 - 3 - 4 - 5 - 6 - b7. The B major pentatonic will give you a "southern rock style" sound and the B mixolydian scale will give you more melodic options. Both scales have a blues quality to them. Picky: What is the relationship between scales and the modes of a scale? Lyle: Good question, there are different chords like major, minor, dominant etc., and so there are different scales too. Modes are scales, scales are modes. It just depends on how you are addressing them at the moment. 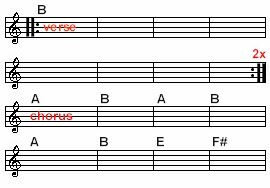 Major chords sound different than minor chords, same with scale and modes. marco: Are these arpeggios supposed to be matching the jam track? Lyle: They work over the chorus section of the jam track. Watch video clip and you'll see and hear it against the chorus section of the jam track. Terry: How do you know what arpeggios to play over what chords in the background? Lyle: During the chorus section the chords are A to B. Both major type chords. I picked a bunch, if not all, of the arpeggios related to the key of E Major. I was thinking the A to B chords are the IV and V chords in the key of E so I starting finding the chords in the key of E, then just played arpeggios of each one. Terry: Are these Major arpeggios? Lyle: Above each arpeggio is the name of it. Lyle: Yes they do. B mixolydian starts on the 5th degree of the E major scale. Lyle: That's about all for this lesson. Any other questions before I sign off? marco: no, I have a lot to study here. Lyle: Good. Have fun jammin and see you next week!